Magazines are the most successful media format ever to have existed: so begins Magazine Journalism as it traces how magazines arose from their earliest beginnings in 1665 to become the ubiquitous format we know today. 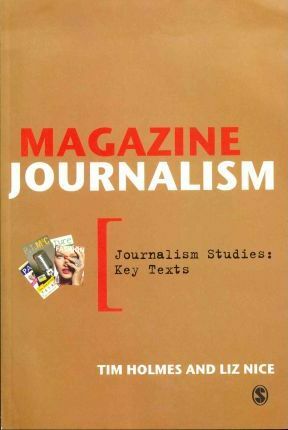 This book combats the assumptions among media academics as well as journalists that magazines somehow don't count, and presents a compelling assessment of the development and innovation at the heart of magazine publishing. In magazines we find some of the key debates in journalism, from the genesis of 'marketing to the reader' to feminist history, subcultures and tabloidization. Embedding these questions in a thoroughly historical framework, Holmes and Nice argue for an understanding of magazine journalism as essential in the media landscape. Moving beyond the semiotic and textual analysis so favoured by critics of the past, the authors complete the story with an exploration of the production and consumption of magazines. Drawing on interviews with more than 30 magazine journalists across the industry, what emerges is a story of resilience, innovation and a unique ability to embrace new markets and readerships. Magazine Journalism takes the reader to the heart of key questions in the past, present and future of journalism and is essential reading for students across media studies.